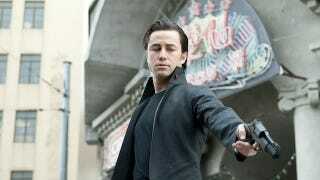 Writer-director Rian Johnson gave San Diego Comic-Con an extended peek at his new film Looper, in which Joseph Gordon-Levitt plays a hit man who has to kill his future self, played by Bruce Willis. But Willis isn't just out to save his neck — he wants to save the future from his past. Minor spoilers ahead. The footage from the film, due out September 28th, re-explains and clarifies the plot: In the future, it's impossible to dispose of a body, so the world's largest criminal organization sends its targets back in time where hitmen called Loopers take out the targets. The targets always arrive at a specified time and place, with their heads covered and their hands bound. This leads to a somewhat comedic sequence of Gordon-Levitt's Joe waiting in a cornfield in front of a sheet and shooting the pillowcase-hooded people who appear on that sheet out of thin air, day after day, over and over. We get a scene between Joe and Jeff Daniels, his time traveling boss. Daniels tells Joe that Joe's the youngest Looper he's ever hired. With Joe coming to the end of his contract, Daniels asks him if he's going to go off somewhere and learn Mandarin. "French," Joe replies. "French?" Daniels sniffs, "Why are you going to learn French?" "Because I'm going to France," says Joe. Daniels leans forward and tells him matter-of-factly, "I'm from the future. You should go to China." The organization has a neat method for retiring Loopers: they send the Loopers back from the future, just like any other target, and the Looper has to kill his future self. It's called "closing the loop." When Joe sees future Joe, though, he's unhooded. Joe hesitates, and future Joe gets away. We saw a longer version of the scene where Joe and future Joe meet in a diner. Future Joe tells Joe that he can't look at him, it's just too strange. "Your face is backwards," younger Joe tells him. Older Joe begins to reprimand his younger self, pointing out that he's a killer, a junkie, a loser. Then he asks Joe if he's heard of the Rainmaker. Younger Joe knows that he's the boss in the future. Well, older Joe has come back to prevent the Rainmaker's rise to power. These are two men who are both trying to ensure that they have a future. For younger Joe, that means killing his older self. For older Joe, it means saving himself from his own past and preventing his terrible future. We hear a voice-over from Gordon-Levitt, explaining that he saw his life as a loop, an endless circle, so he decided to break the loop. Although the film involves time travel, Johnson was quick to point out that this isn't a time travel movie in the vein of Primer, where time travel is a central element of the storytelling. "I took my time travel logic from Terminator One," he said. "Time travel sets up the situation, then gets out of the way." Emily Blunt, who plays Sara as "the best movie I've been a part of," and Gordon-Levitt was excited to be reunited with his Brick director. Johnson agreed, noting that no matter the scope of a movie, filmmaking boils down to a few folks working with a camera, and "It's always best to make movies with your friends."